I wasn't going to do one of these, but I've been lazy and absent lately so I figured I might as well. 2009 was a mixed year for me. Writing wise and personally. Even though I'm not quite where I want to be when it comes to writing, I did start working at it more this past year. I don't like looking back in the past, so instead here are some personal and professional goals for the coming year. 1. Get my own apartment. I'm nineteen years old and still living with my father. Now, that might not seem too bad for some of you, but after living on my own for a year it's really hard living with a parent again. 2. Finish up high school. By this summer, I'm going to be a goddamn high school graduate if it kills me. 3. Finish all three drafts I started in 2009. For VDGP, that shouldn't be too hard. That story still speaks to me the most. College For Witches, on the other hand, needs to be totally ripped apart and redone. TFA is going to need a lot of work as well. 4. Start at least one completely new story. 5. FINISH NANO! Nano has defeated me two years in a row and I won't stand of it again. 6. Read 100 books, which is only 20 more than I read this year. Shouldn't be too hard. 7. I have some fitness and weight goals for next year too but I won't go into detail there. 8. Post on here at least once a week. I'm sure I have more goals as the year goes on. But even if I just reach a few of these, I'll be damn proud of myself. I hope everyone keeps checking in withe me and hounds me every now and then about these goals. Something about people I've never met before yelling at me motivates me strongly. Anyone else have some goals for the new year? 10. 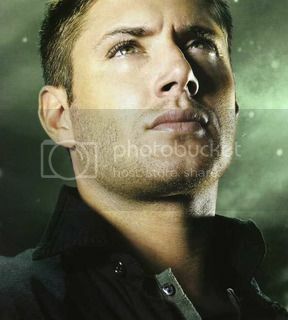 Spend more time looking at hot men, like Jensen Ackles. It just makes my day seem so much brighter. Good luck with your goals, and happy New Year!